I am usually a stickler about bedtimes before school nights, but last night I made an exception for the older boys. Ryan and I and the two older boys sat down and watched a movie together. Normally, I wouldn't be interested in a documentary, but this one is one that is sooo worth watching! It is called Which Way Home. 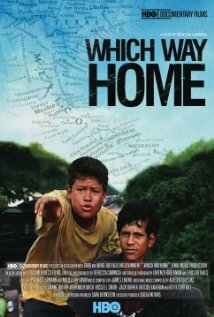 Which Way Home shows the personal side of immigration through the eyes of children who face harrowing dangers with enormous courage and resourcefulness as they endeavor to make it to the U.S. The film follows several unaccompanied child migrants as they journey through Mexico en route to the U.S. on a freight train they call "The Beast." These are stories of hope and courage, disappointment and sorrow. They are the ones you never hear about - the invisible ones. When you watch this movie and sit next to a child who can actually tell you his own stories about "The Beast" and what it was like to ride on top of it for 8 days straight, it doesn't feel as foreign to you. The experiences these children had in the documentary are so close to what he experienced himself that he told us more then once that this was his history. The most terrifying part of the story is that there are more unhappy endings then there are happy ones. I am very thankful that our boys have the opportunity to have the happy ending! So if you are curious about how these children from Mexico and Central America come to this country take a look at the clips online for this film or the film itself. Of course not all children have these experiences, but some of them are very similar to this film with the train and smugglers.